..:: AsmBB ::.. "Assembly language in top ten of Tiobe index"
For July 2016, assembly language has entered the top 10 of Tiobe language popularity index. Again. In September 2016, assembly language was 8-th in Tiobe index. (unfortunately, I missed to get a screenshot). In October it was 11-th. I have asked SkyNet to find this information for you. I read your article about Assembler rating by TIOBE. Well, if this is so important for you, then I once again asked SkyNet to get this detailed information at this firm. SkyNet answered: "I am busy with simulation of next nuclear war, go and take it yourself.". I came there and told: "I need your detailed information on the Assembler". They gave this diagram to me. Today is the last day of the month - "time to feed parakeet". 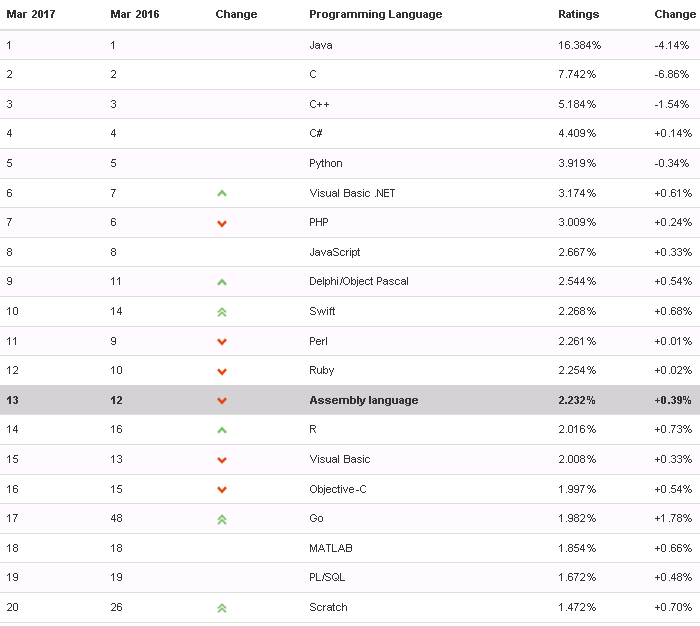 Well, in February, assembly language takes the 13-th place in the index. Not a good month for assembly programming. Or the other way - good reason to program in assembly and this way to push it back to the top! The March parakeet did not wait for your feeding and died of hunger, but SkyNet kept the corpse and sent it to you. Oh, yes thanks! And for April it keeps its 13th place, so I will not publish a special screenshot. And again, assembly language goes up in the chart in May 2017. It is 8-th now and if you look at the second graphic, you can see, that such growth is a trend, not a random fluctuation. Unfortunately in July and August, assembly language has fallen down to 14-th position in the index. It is not clear is it some fluctuation or a trend. But writing assembly language and publishing the sources and articles about assembly language programming should help to raise it up again. In September assembly language is again one level lower - down to 15-th place in the Tiobe index. 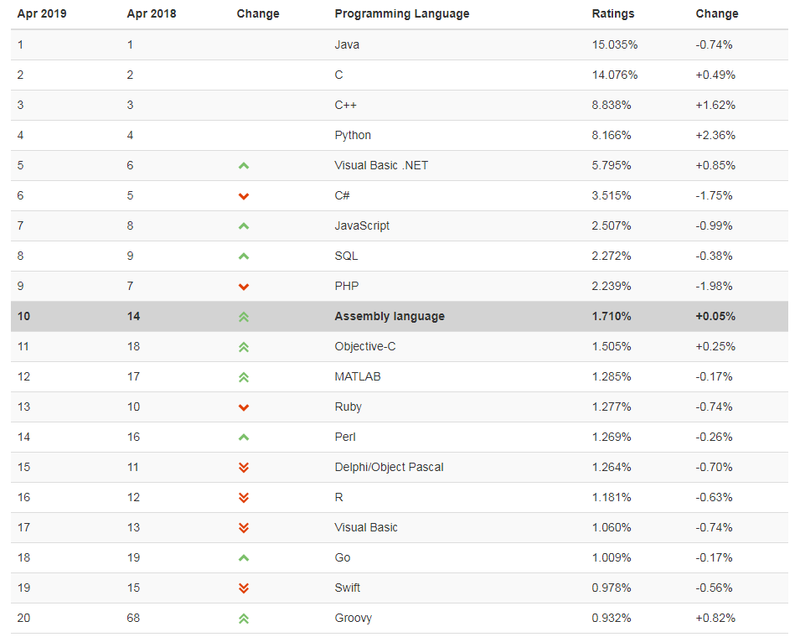 In January 2018, assembly language is again out of the top-10. Despite the absolute numbers increase (from 1.471% in December to 2.056% in January) assembly language is still at 15-th line of the index. Hope the trend will keep raising. I&apos;ll just leave it here. Rise of the Assembler. Again. This forum contains 15633 posts in 182 threads. We have 261 registered users. In the last 24h there was 763 visitors on the forum.